Although abbreviated due to Atlanta’s winter weather event, the day did not disappoint as both men and women engaged to learn more about women’s equality and advancement in the business environment. Erika James, John H. Harland Dean of Emory University’s Goizueta Business School, opened the conference stating there is no better time than right now to discuss women’s equality in the workplace. Bringing together business and educational leaders to increase dialogue. Engaging companies with resources to secure a diverse workforce. Empowering women with knowledge and confidence to advance their careers. Creating environments that allow female students to thrive. Offering new and thoughtful programming for female alumni. 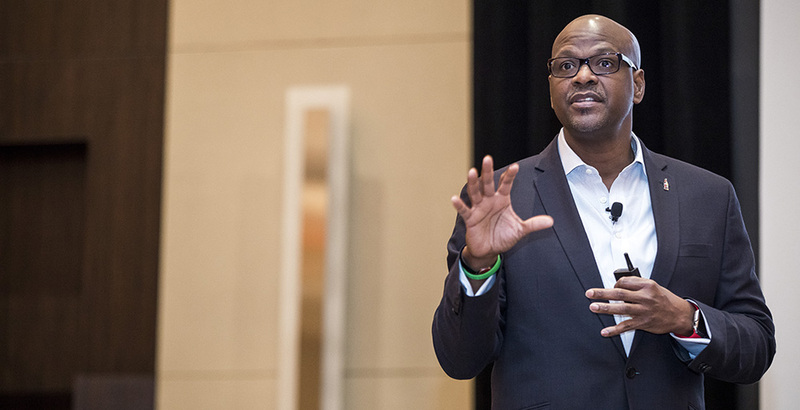 Focusing on gender inequality directly was keynote presenter, Andrew Davis 08WEMBA, global chief diversity & inclusion officer at The Coca-Cola Company. Davis walked attendees through the Coca-Cola journey with a focus on how the company approaches gender and diversity in its workforce. In the U.S., 40 percent of Coca-Cola’s bottlers are minority owned, according to Davis. While the diversity-inclusion strategy at Coca-Cola is not a one-man or one-woman job, Davis said it’s important to have someone in a point leadership position. Women represent roughly 47 percent in the workplace, according to statistics from Davis. However, women control 70 percent of the buying power in their communities and homes, equating to 40 trillion dollars globally by 2018. To cap off his presentation, Davis left attendees, specifically women, with a challenge moving forward.